DUP LEADER ARLENE Foster has criticised Theresa May over a letter from the British Prime Minister suggesting the EU is pushing for a border down the Irish Sea, in the wake of Brexit. The letter, leaked to the Times of London, suggests a Brussels plans to put a customs border in the Irish sea in the event of a no-deal Brexit. Provision for the sea border would be included in any divorce agreement, according to May’s letter to the unionist party, effectively keeping Northern Ireland within the EU customs union and single market. The Brussels plan aims to avoid a return to a hard border on the island of Ireland. In the letter, according to the Times, May said she could not accept any “circumstances or conditions” that would break up the UK into two customs territories. 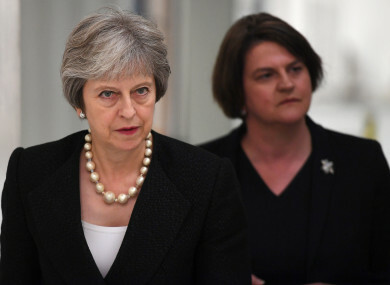 The DUP’s Foster, however, has said that the letter raised “alarm bells” and that “it appears the prime minister is wedded to the idea of a border down the Irish Sea, with Northern Ireland in the EU single market regulatory regime”. The EU plan would see Northern Ireland tied to the customs union should Brexit negotiations fall through. The “backstop” measure ensures that Northern Ireland would stay aligned to the regulations of the single market and the customs union if there is still no other solution that would avoid infrastructure along the Irish border and has become one of the chief sticking points in the negotiations between the EU and the UK. In the letter, May says that, although Europe is still pushing for a “backstop to the backstop”, she could not allow a divide between the rest of the UK and Northern Ireland to “come into force”. The wording of May’s letter – sent on Tuesday to Foster and her deputy Nigel Dodds – has been interpreted by the DUP to mean that such a clause could be inserted into a final agreement. 29.10.18 A Brexit timeline: How much time is actually left to strike a deal? The Prime Minister relies on the DUP for her House of Commons majority. In recent days, British media has reported that a final withdrawal agreement is imminent. According to the Times, British officials have been told that a special cabinet is expected to meet next Tuesday to discuss the final shape of a divorce deal. Tánaiste Simon Coveney, however, has urged caution about an imminent breakthrough in the Brexit negotiations. Speaking yesterday, Coveney said it should not be assumed that just because the UK Cabinet agrees on something, that an overall deal has been agreed with the EU. Email “'Alarm bells' ringing for DUP as May letter raises prospect of EU customs border in Irish Sea ”. Feedback on “'Alarm bells' ringing for DUP as May letter raises prospect of EU customs border in Irish Sea ”.